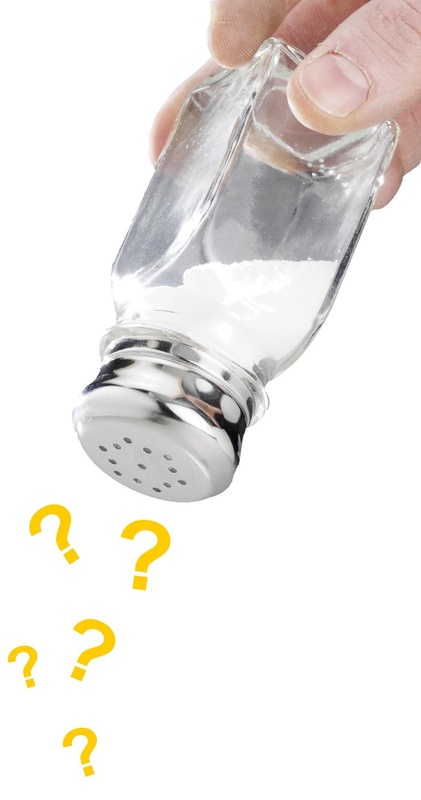 The overall evidence around salt and harm to health (as outlined in two recent systematic reviews (1, 2)) has been described as strong enough to justify public health action to reduce high levels of sodium intake. Indeed, as recently as August 2014 a new study estimated that there were 1.65 million deaths globally from cardiovascular causes in 2010 attributed to sodium consumption above a reference level of 2.0 g per day (3). This study included a new meta-analysis of 107 published trials of sodium reduction and reduced blood pressure (BP). Furthermore, the risk factor of a “diet high in sodium” has been estimated to be one of the top two dietary risk factors for disease burden identified in the massive Global Burden of Disease Study (4). “Salt reduction” has also been included in the top five priority actions for non-communicable disease (NCD) control internationally (5), and for reducing NCD inequalities (6). However, the evidence relating to sodium and health has always been controversial to some extent (7). In particular, a recent Institute of Medicine Report (8) highlighted the uncertainty around the health benefits and risks of reducing sodium intakes below the 2300 mg/day level (see the Table below). Most recently, a large study has been reported in the New England Journal of Medicine by O’Donnell et al (12). It reports a “U-shaped” relationship for dietary salt intake and all-cause mortality and also for cardiovascular events (see the Figure below). 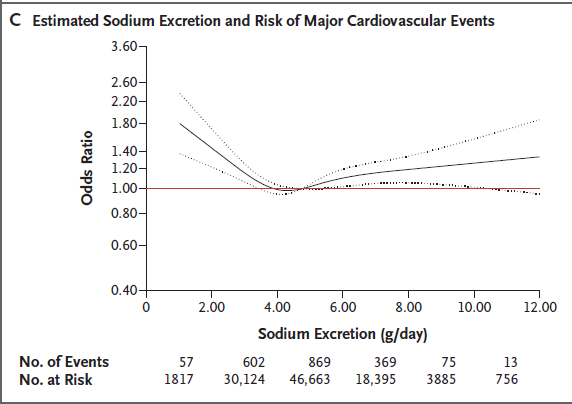 Of note is that the increased cardiovascular risk was estimated to only start increasing from the lowest estimated risk level (4-5g of sodium – see Table above). Other work has also reported such a J-shaped or “U-shaped” relationship (13-16)) but the last two of these cited studies included people with established cardiovascular disease (so reverse causation is possible – see below). But the O’Donnell et al study is by far the largest that has reported such a pattern. Indeed, it involved over 100,000 subjects from 17 countries. It had other desirable features: 95% follow-up of subjects, 3.7 years of follow-up on average, it considered dietary potassium intake as well, and it undertook various analyses to explore the possibility of reverse causation, sensitivity analyses around potential confounding (array-approach), and propensity-score matched sensitivity analyses. It was a prospective study and these all suffer from the possibility of residual confounding (unmeasured and mismeasured variables). But the authors did analyses to explore this and point out the level of confounding by a single confounder would need to be large to nullify their findings – and peculiar to generate the U-shape. Nevertheless, if there are multiple confounders on many separate “backdoor paths” (epidemiological jargon for considering other causal pathways) then several modest confounding processes could conceivably sum up to create such a relationship (but, again, we have difficulty seeing how this might result in a “U-shaped” relationship). Unlike with alcohol whereby confounding may generate a J-shaped curve, it is difficult to posit that people with average salt consumption have better profiles on other risk factors than either low and high salt consumers, and that this is not measured or known. “Reverse causation cannot be completely ruled out” as the authors’ state. Reverse causation would arise if early CVD disease caused a lowering of salt intake. The authors excluded people with any pre-existing CVD, and it made no substantive difference to findings. But, it would have been ideal to have even longer follow-up. They used spot urine measures (and only a single measure) rather than the gold standard of 24-hour urines to measure sodium. There are still uncertainties with the utility of the spot urine measure (see this systematic review of 20 studies (17)). Nevertheless, any such measurement error would tend to weaken the association with sodium intake and health outcomes. Again, it would seem to take a very odd correlation of measurement error processes to generate a “U-shaped” association. Furthermore, the study found the expected relationship with salt and higher BP which suggests that this is unlikely to be problematic (i.e., BP results can be seen as functioning as a sort of internal control on the validity of the study). There was some dominance of Chinese subjects (42% of the total) – though there was adjustment for Asian vs non-Asian in the analyses. It is still just one study (albeit large and apparently well designed). It is still just an observational study. A large RCT with an intervention to lower sodium intake would be scientifically superior. There is no obvious mechanism for why low sodium intakes might be hazardous (given the very small amounts that are thought to be required for normal physiological functioning). Nevertheless, some other studies have also suggested this U-shaped relationship (see above) and many nutrients follow J-shaped relationships of both too little and too much being problematic for health (e.g., selenium, vitamin A, and total intake of dietary energy). The new O’Donnell et al study is large and appears to be fairly robust. As such it probably needs to be considered as a serious challenge to certain aspects of the current prevailing view around the level at which the intake of dietary salt impacts on health outcomes. While there is no doubt that very high salt intakes are hazardous – it is now somewhat uncertain if too little salt is also hazardous and what the threshold is before the hazard starts to appear (for both too little and too much). This blog post should be treated as our preliminary perspective. This new study will probably generate much academic discussion and probing. We plan to update our perspective in the future (keep checking Public Health Expert blog). The World Health Organization (WHO) could establish a high-level review panel and clarify the state of the evidence and the future research agenda. Such a panel may have maximum credibility if it just had scientists with no past publications relating to dietary salt and health. If this is widely seen as the most efficient option – the NZ Government could request that WHO takes on this task. Health authorities could just wait until a large cluster-randomised trial in China is completed (18) (it includes replacing some sodium chloride [NaCl] intake with potassium chloride [KCl]). But perhaps it will still not be clear if any benefit is due to the higher potassium or the lower sodium (or a mix of both). Health authorities could proceed with certain sodium reduction actions that still have a high probability of being favourable. That is the reformulation of various high salt products to replace some of the NaCl with KCl in some other processed foods (as has already been happening for some foods in NZ e.g., some soup products). The evidence that increased dietary potassium is good for cardiovascular health is now fairly strong (e.g., these two meta-analyses (19, 20), as well as the O’Donnell et al study for lower risk of death and major cardiovascular events combined (12)). A recent meta-analysis of 5 RCTs using salt substitutes has also reported a benefit for reducing systolic and diastolic blood pressures (21). Furthermore – the health advice to eat more whole foods and to avoid a high intake of processed foods (usually high in all three of: salt, sugar and saturated fat) still stands. Indeed, a junk food tax (as recently introduced by Mexico) could well be justified on numerous health grounds and not just on sodium levels. The relationship between dietary salt and poorer health is still fairly certain for very high intakes – but given recent research findings there is less confidence about the associations for other levels of intake. Given this uncertainty there appears to be a reasonable case for a WHO-led expert review. 1. He FJ, Li J, Macgregor GA: Effect of longer-term modest salt reduction on blood pressure. Cochrane Database of Systematic Reviews 2013, 4:CD004937. 2. Aburto NJ, Ziolkovska A, Hooper L, et al: Effect of lower sodium intake on health: systematic review and meta-analyses. BMJ 2013, 346:f1326. 3. Mozaffarian D, Fahimi S, Singh GM, et al: Global sodium consumption and death from cardiovascular causes. The New England Journal of Medicine 2014, 371(7):624-634. 4. Lim SS, Vos T, Flaxman AD, et al: A comparative risk assessment of burden of disease and injury attributable to 67 risk factors and risk factor clusters in 21 regions, 1990-2010: a systematic analysis for the Global Burden of Disease Study 2010. Lancet 2012, 380(9859):2224-2260. 5. Beaglehole R, Bonita R, Horton R, et al: Priority actions for the non-communicable disease crisis. Lancet 2011, 377(9775):1438-1447. 6. Di Cesare M, Khang YH, Asaria P, et al: Inequalities in non-communicable diseases and effective responses. Lancet 2013, 381(9866):585-597. 7. Bayer R, Johns DM, Galea S: Salt and public health: contested science and the challenge of evidence-based decision making. Health Affairs 2012, 31(12):2738-2746. 11. McLean R, Williams S, Mann J, Parnell W: How much salt are we eating? Estimates of New Zealand population sodium from the 2008/2009 Adult Nutrition Survey [Presentation on 2 December 2011]. Joint Annual Scientific Meeting of the Australian and New Zealand Nutrition Societies. Queenstown, New Zealand (29 November – 2 December); 2011. 12. O’Donnell M, Mente A, Rangarajan S, et al: Urinary sodium and potassium excretion, mortality, and cardiovascular events. The New England Journal of Medicine 2014, 371(7):612-623. 13. Graudal N, Jurgens G, Baslund B, Alderman MH: Compared with usual sodium intake, low- and excessive-sodium diets are associated with increased mortality: a meta-analysis. Am J Hypertens 2014, 27(9):1129-1137. 14. Pfister R, Michels G, Sharp SJ, Luben R, Wareham NJ, Khaw KT: Estimated urinary sodium excretion and risk of heart failure in men and women in the EPIC-Norfolk study. European Journal of Heart Failure 2014 [E-publication]. 15. O’Donnell MJ, Yusuf S, Mente A, et al: Urinary sodium and potassium excretion and risk of cardiovascular events. JAMA 2011, 306(20):2229-2238. 16. Thomas MC, Moran J, Forsblom C, et al: The association between dietary sodium intake, ESRD, and all-cause mortality in patients with type 1 diabetes. Diabetes Care 2011, 34(4):861-866. 17. Ji C, Sykes L, Paul C, et al: Systematic review of studies comparing 24-hour and spot urine collections for estimating population salt intake. Pan American Journal of Public Health 2012, 32(4):307-315. 18. Li N, Yan LL, Niu W, et al: A large-scale cluster randomized trial to determine the effects of community-based dietary sodium reduction–the China Rural Health Initiative Sodium Reduction Study. American Heart Journal 2013, 166(5):815-822. 19. Aburto NJ, Hanson S, Gutierrez H, et al: Effect of increased potassium intake on cardiovascular risk factors and disease: systematic review and meta-analyses. BMJ 2013, 346:f1378. 20. D’Elia L, Iannotta C, Sabino P, Ippolito R: Potassium-rich diet and risk of stroke: updated meta-analysis. Nutrition, Metabolism, and Cardiovascular Diseases 2014, 24(6):585-587.